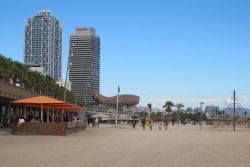 After many years giving its name to the strip between Sant Miquel Beach and the Moll de Marina pier Barceloneta Beach now spans the part of the seafront between the Gas Breakwater to the Ginebra breakwater. 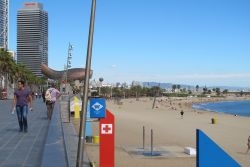 Barceloneta Beach is one of the oldest and most traditional beaches in the city. Its 422 metres of golden sand are frequented by tourists and locals from the ancient Barceloneta fishing district. The beach is popular for its restaurants and cafés serving tapas, fisch and seafood and there are also facilities for beach volleyball, beach tennis and table tennis. An arcade runs along the top of the beach and houses the Espai de Mar (Sea Space), an environmental education centre to promote access to the beach and marine facilities through the practice of sport and leisure activities. The beach provides excellent facilities for disabled people and an assisted bathing service including an amphibious chair to give easy access to the sea. The beach can be easily reached by metro, tram, bus and bike, with a cycle lane along the Barceloneta seafront and bike hire facilities.